Gavin Skelly rises for a layup. The junior forward and the Wildcats secured a huge win Sunday at No. 7 Wisconsin. MADISON, Wis. — On the road against one of the country’s top teams and mired in a disheartening two-game losing streak with leading scorer Scottie Lindsey on the bench, Northwestern clearly was the underdog in its trip to Madison. 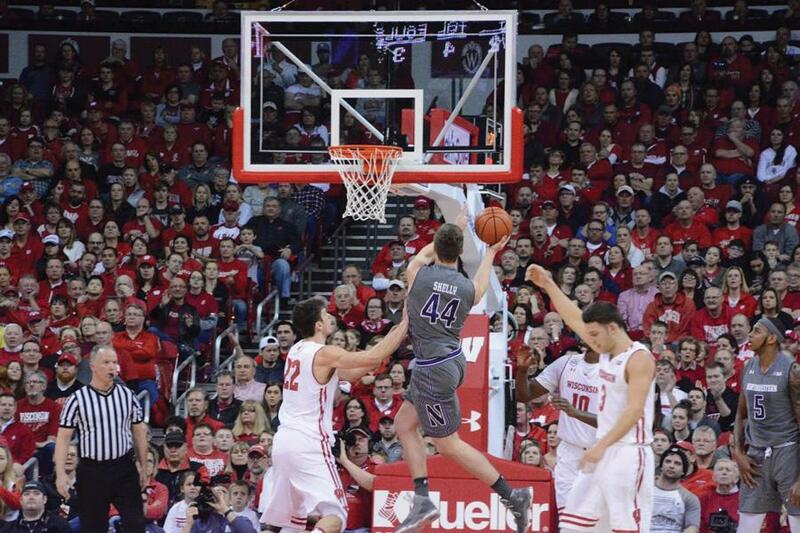 If the Wildcats (19-6, 8-4 Big Ten) knew that, they didn’t play like it. Instead, they led for all but 36 seconds of the second half to hold off No. 7 Wisconsin (21-4, 10-2) 66-59, notching a huge road win in the team’s biggest victory of the season to date. The Badgers figured to have an edge in the paint coming into the game, featuring forwards like Wooden Award finalist Ethan Happ and Big Ten preseason player of the year Nigel Hayes. Happ scored 7 early points as Wisconsin sprinted out to a 14-6 lead less than seven minutes into the game. The Cats clawed back, though, coming alive offensively with a 16-0 run from 7:56 to 4:09 in the first that featured a pair of 3-pointers apiece from sophomore forward Vic Law and senior forward Nathan Taphorn. A banked-in 3 from McIntosh late in the half capped off a solid shooting period for the visitors — a welcome sign after struggling in two straight defeats — and gave NU a 31-22 edge at halftime. Everything was going according to plan for the Cats after the first half, but Wisconsin had other ideas on the opposite side of the break. With energy on defense and crisp ball movement on offense, the Badgers sprinted out on a 10-0 stretch from the start of the second half to grab the lead, a strong statement from the Big Ten’s top-ranked team that brought the home crowd back into the game. NU gamely absorbed the blow and fought back. The Cats went on an 8-0 run punctuated with a putback dunk from sophomore center Dererk Pardon, turning the tide for good in NU’s favor. As Wisconsin challenged for the lead, its advantage in the paint had largely evaporated. The Cats won the battle inside by doubling heavily in the post with Pardon and senior forward Sanjay Lumpkin, holding Happ and Hayes to a combined 22 points on 8-of-19 shooting from the floor. With its big men stymied, the Badgers shot just 38 percent from the field and turned the ball over 12 times on the night. Meanwhile, NU outscored the hosts 26-12 in the paint and took care of the ball, ending the game with only six turnovers. With role players stepping up inside and outside, the stage was set for McIntosh to take over, and he delivered 25 points to keep the Cats on track. NU held a 56-49 lead coming out of the final media timeout of the second half, an uncomfortable position for a team that’s had issues closing out big games this season. But there were no signs of trouble late, as the Cats hit free throws and never let Wisconsin within 4 points of the lead. Instead, when Lumpkin slammed home a run-out dunk with four seconds on the clock for NU’s final points, the Cats wrapped up a deserved win and sent a message that could reverberate until March.